The Old Basilica was constructed on the site of an earlier 16th-century church that was finished in 1709. 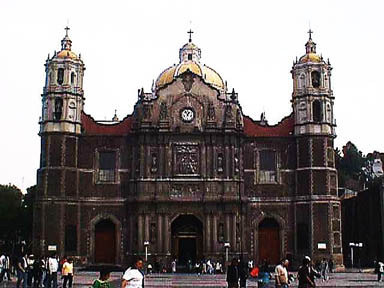 When this basilica became dangerous due to the sinking of its foundations, a modern structure called the New Basilica was built nearby; the original image of the Virgin of Guadalupe is now housed in this New Basilica. 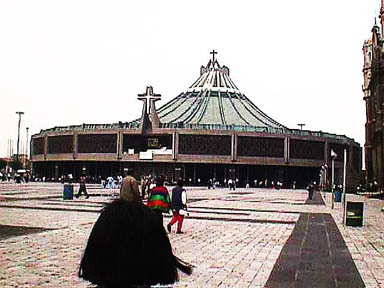 Built between 1974 and 1976, the new Basilica was designed by architect Pedro Ramirez Vasquez. It has a circular floor-plan so that the image of the Virgin can be seen from any point within the building. An empty crucifix symbolises Christ's resurrection. The choir is located between the altar and the churchgoers to indicate that it, too, is part of the group of the faithful. To the sides are the chapels of Santisimo and of Saint Joseph. Location: The Basilica is located in Mexico City, in the northern neighbourhood of Villa de Guadalupe Hidalgo (or simply "la Villa"). From Historic Centre take metro Line 3 at Hidalgo and transfer with Line 6 at Deportivo 18 de Marzo to the next station La Villa Basílica. Then walk north two busy blocks until reaching the Square. From Zona Rosa take a Pesero or Bus in Reforma Avenue up to terminal near Basílica. Or take a taxi from your hotel.